In rehabbing senior horses retiring from therapy work with at-risk youth, the horses that come to God’s Window are typically well-trained, docile horses. Often times they just need a break and allowed to be a horse and do horse things 24/7. I once learned from horse ethologist, Mary Ann Simonds, that in wild horse language, whoever has their eyes in front is the leader. A wild stallion who takes one of his foals on patrol with him, will clearly have his eyes in front and then the baby’s eyes and head are just behind the stallion’s eyes and ears. There is a wonderful photograph by Barbara Wheeler of this body positioning. As an experiment, I started leading my horses that way to see what would happen. It has made such a positive difference in safely leading my horses that I don’t even remember exactly how I used to lead horses. 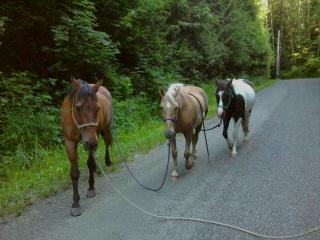 The first time I need to lead any horse with a halter and lead rope, I establish this boundary right away. My eyes are in front, and the horse’s eyes are behind me. I begin by taking a few steps and then stopping. Once I stop, I turn around and remain where I stopped and then ask the horse to back two steps away from me. Once they do that, then I turn back around and take a few steps forward. I stop again, and turn around and ask the horse to back up two steps. This is all done in a very low-key way. I keep doing this exercise until the horse starts to stop with its eyes behind my shoulder. I remember the day my second horse, Thunder, arrived. 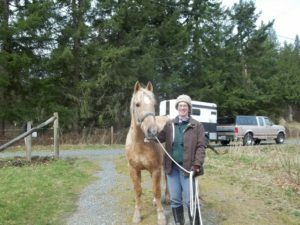 He was a 27 year-old gelding and a very well trained, docile horse. I hesitated to immediately do too much boundary setting with him right as he walked off the trailer because I didn’t want to impose anything on him. He had just retired and was seeing his new home for the first time. As we walked down the driveway his ears were perked forward and his head was up surveying the area and the resident herd of three horses. His energy was also up, and he had a forward walk. Since I was just walking with him down the driveway and not asserting any leadership on my part, he led the way and walked in front of me. I ended up being at his shoulder. I let this go on for about half-way down the driveway when I realized that this was not the safest place for me to be. He was clearly in front of me and focused on the resident herd, and not really aware of me. I am at Thunder’s shoulder, and his eyes are in front of mine, which tells him that he is leading me, which is not the safest place for me to be. I decided to take back the leadership role and set a few boundaries before anything got further out of hand. I backed him up a few steps until he was behind me. Then I walked forward a few steps, stopped and backed him up again. After about three times of doing this he took a submissive posture behind me. He was still very aware of his surroundings, and he was listening to me as well. I felt much safer, and the rest of the day unfolded without incident. In the days after Thunder arrived, I took a walk with all three of us: me, Thunder and Chaco, my first horse. I was really black and white with the boundary that both of them needed to be behind me when I led them together on a walk. Walking two horses at the same time had double the capacity for something to go wrong, so the best chance I had of safely walking them together was for both of them to respect the boundaries I needed, which was both of them walking behind me. Chaco had no problem stopping behind me having seen this routine for years. Thunder, however, was new. Several times he stopped in front of me. I would patiently back him until he was behind me and then go forward again. On one of these corrections to Thunder’s positioning, Chaco stopped at a respectful distance and cocked a hind leg in relaxation taking a standing nap while Thunder learned the ropes. Chaco knew the routine and didn’t bother testing the boundary. Thunder, however, was new and not familiar with the routine. But it didn’t take long. Within a few walks he was regularly walking behind me. Once that was in place, I felt comfortable asking him to walk ahead of me on occasion or laying the lead rope over his back while he grazed the plants on the trail. Whether leading two horses or one, the simple boundary of placing the horse behind me when leading has allowed our walks to become a calm and peaceful outing. I feel safe, and the horses feel safe, which builds mutual trust. What a great way to safely enjoy the beautiful surroundings and the company of my horses. Notice how the first horse has his eyes in front. He is leading. The two following horses both have their eyes behind the horse they are following. This is a submissive posture.